"Ladybird" and "ladybug" redirect here. Coccinellidae is a family of small, rounded (hemispheric), usually bright colored, short-legged beetles, known variously as ladybugs (North American English), ladybirds (British English, Australian English, South African English), or lady beetles (preferred by some scientists). Unlike most insects, ladybugs have caught people's imagination and are generally held in high regard. In some cultures, they are considered a sign of good luck, whose killing brings bad luck. Their very name (ladybug or ladybird) is believed to be a dedication to the Virgin Mary, mother of Jesus. Their image is used in artwork, jewelry, and movies. More than this, they also are important ecologically and agriculturally, with most species feeding on aphids and scale insects, and thus controlling these agricultural pests. As arthropods (Phylum Arthropoda), ladybugs have jointed appendages, an exoskeleton (hard, external covering), segmented body, ventral nervous system, digestive system, and open circulatory system. As insects (Class Insecta), they have three pairs of jointed legs; an abdomen that is divided into 11 segments and lacks any legs or wings; ectognathous or exposed mouthparts, and a body separated into three parts (head, thorax, and abdomen), with one pair of antennae on the head. As beetles (order Coleoptera), they are characterized by a particularly hard exoskeleton, and the hard wing-cases (elytra) that tend to cover the hind part of the body and protect the second wings, the alae. The elytra are not used in flying, but generally must be raised in order to move the hind wings. Coccinellids are small insects, ranging from one to ten millimeters (0.04 to 0.4 inches). They have short legs and are nearly hemispheric dorsally. They are commonly yellow, orange, or scarlet with small black spots on their wing covers, with black legs, head and antennae. A very large number of species are mostly or entirely black, gray, or brown, however, and may be difficult for non-entomologists to recognize as coccinellids. (Conversely, there are many small beetles that are easily mistaken as ladybugs, such as tortoise beetles). It is believed that coccinellids are often brightly colored to ward away potential predators. This defense works because most predators associate bright colors (especially orange and black or yellow and black) with poison and other unpleasant properties. This phenomenon is called aposematism. In fact, most coccinellids are indeed poisonous to smaller predators, such as lizards and small birds. However, a human would have to eat several hundred coccinellids before feeling any effects. Adult coccinellids are able to reflex-bleed hemolymph from their leg joints, releasing their oily yellow toxin with a strong repellent smell. This becomes quite obvious when one handles a coccinellid roughly. 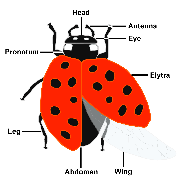 Coccinellids are typically predators on Hemiptera, such as aphids and scale insects, though members of the subfamily Epilachninae are herbivores, and can be very destructive agricultural pests (e.g., the Mexican bean beetle). They are also known to eat certain plants and crops when no other food is present, making them a possible pest to farmers and gardeners. While they are often used as biological control agents, introduced species of ladybugs (such as Harmonia axyridis or Coccinella septempunctata in North America) can outcompete and displace native coccinellids, and become pests in their own right. Ladybirds are usually found where aphids or scale insects are, and they lay their eggs near their prey to increase the likelihood the larvae will find the prey easily. Since aphids and scale insects occur nearly everywhere in the world, ladybirds are also cosmopolitan. The family name comes from its type genus, Coccinella. Ladybugs are endopterygotes—a superorder of insects of the subclass Pterygota that go through distinctive larval, pupal, and adult stages, or complete metamorphosis. Complete metamorphosis, also called holometabolism and complex metamorphosis, is a term applied to those processes in which the larvae differ markedly from the adults. Insects that undergo holometabolism pass through a larval stage, then enter an inactive state called pupa, and finally emerge as adults (imago). Most coccinellids mate in spring or summer and the female lays a cluster of eggs (numbering from a few to a few hundred, depending on species) as near as possible to an aphid colony. In most species, these eggs hatch into a larval state within a week. This state lasts 10–15 days, and they then go into a pupal stage before becoming an adult coccinellid. The entire life cycle of the Coccinellid is only for to seven weeks. Most ladybird species are univoltine, producing only one generation a year, although some are bivoltine. Coccinellids lay extra infertile eggs with the fertile eggs. These appear to provide a backup food source for the larvae when they hatch. The ratio of infertile to fertile eggs increases with scarcity of food at the time of egg laying (Perry and Roitberg 2005). Some species are migratory and form large aggregations during the migratory period. They also form large aggregations when they go into hibernation in winter (Honek et al. 2007). As in many insects, ladybirds in temperate regions enter diapause during the winter. Some species (e.g., Hippodamia convergens) gather into groups and move to higher land, such as a mountain, to enter diapause. Ladybugs are generally considered useful insects as many species feed on aphids or scale insects, which are pests in gardens, agricultural fields, orchards, and similar places. Most are beneficial to gardeners in generally, and in the spring it is not uncommon to find them in a vegetable garden feeding on aphids. Both adults and larva consume the pest insects. Although native species of coccinellids are typically considered benign, a few species are pests in North America and Europe. 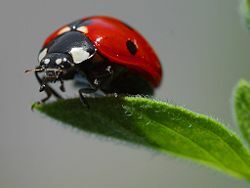 In North America, the Asian lady beetle (Harmonia axyridis), introduced in the twentieth century to control aphids on agricultural crops, has become a serious household pest in some regions owing to its habit of overwintering in structures. 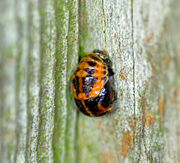 It is similarly acquiring a pest reputation in Europe, where it is called the "harlequin ladybird." Ladybugs also have cultural importance. The name ladybug or ladybird is believed to date from the Middle Ages and have derived from being dedicated to the Virgin Mary. Some people consider seeing ladybugs, or having them land on one's body, to be a sign of good luck to come, and that killing them presages bad luck. Coccinellids are, and have for very many years been, favorite insects of children. The insects have had many regional names (now mostly disused) such as the lady-cow, may-bug, golden-knop, golden-bugs (Suffolk); and variations on Bishop-Barnaby (Norfolk dialect)—(Barney, Burney) Barnabee, Burnabee, and the Bishop-that-burneth. Take thy wings and flee away! The lady bug is generally thought of very favorably in various cultures. In parts of Northern Europe, tradition says that one's wish is granted if a ladybird lands on oneself. In Italy, it is said by some that if a ladybird flies into one's bedroom, it is considered good luck. In central Europe, a ladybird crawling across a girl's hand is thought to mean she will get married within the year. In Russia, a ladybird is called Божья коровка (God's cow) and a popular children's rhyme exists with a call to fly to the sky and bring back bread. Similarly, in Denmark a ladybird, called a mariehøne (Mary's hen), is asked by children to fly to "our lord in heaven and ask for fairer weather in the morning." In Irish, the insect is called "bóín Dé"—or "God's little cow." In some cultures they are referred to as lucky bugs (Turkish: uğur böceği). In Greece, ladybugs are called πασχαλίτσα (paschalitsa), because they are found abundantly in Eastertime along with paschalia, the common lilac plant, which flowers at the same time. Coccinella species from the U.S.
Harde, K. W. 1984. A Field Guide in Colour to Beetles. Octopus. Honek, A., Z. Martinkova, and S. Pekar. 2007. Aggregation characteristics of three species of Coccinellidae (Coleoptera) at hibernation sites European Journal of Entomology 104(1): 51–56. Retrieved January 3, 2008. Perry, J., and B. Roitberg. 2005. Ladybird mothers mitigate offspring starvation risk by laying trophic eggs. Behavioral Ecology and Sociobiology 58: 578–586. This page was last modified on 6 March 2017, at 20:53.